SPOILER WARNING - THIS POST CONTAINS SEVERAL SPOILERS FOR THE IDW ALLIANCE AND DEFIANCE COMICS AS WELL AS THE VEILED THREAT NOVEL AND POSSIBLY REVENGE OF THE FALLEN ITSELF. PROCEED ONLY IF YOU DON'T CARE IF YOU'RE SPOILED. 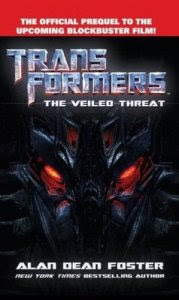 Just released is the Transformers - Revenge of the Fallen prequel novel THE VEILED THREAT by Alan Dean Foster. clocking in at 281 pages for $7.99 US, it promises to bridge the gap between the first and second movies. But before we get into the novel, just to catch everybody up on where we are, I’ll summarize the relevant portions of the IDW prequel comics stating with Defiance and then on to Alliance. In the distant past the Allspark created a race of interdimensional beings on the planet that would become Cyberton. After beginning to cyberform their planet, they learned that the Allspark needed to be periodically renewed, and that the only way to do this was through the energies of an exploding star, so, being unable to search themselves, the Allspark provided by creating the Transformers. Seekers like Jetfire were sent to find suitable stars and constructors like the Constructicons were then sent to build harvesters to reap exploding stars’ energy to channel into the Allspark. A harvester was built on Earth, but before the sun was destroyed, one of the interdimensional beings, The Fallen, betrayed his brethren and destroyed their sarcophagi, which apparently house their essences, but before he could seize all the power for himself, his fellows managed to entomb him within his own sarcophagus artifact. The Harvester failed to activate and had an Egyptian pyramid built around it by the natives. So, fast-forward to Optimus Prime and his archeological team finding The Fallen’s sarcophagus on Cybertron. 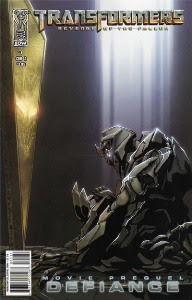 The Fallen begins talking to Megatron and orders him to begin a war of conquest and a search for the Harvester. Decepticon/Autobot war ensues and the Nemesis is built to aid in the search. The Fallen’s sarcophagus leaves onboard with Soundwave and most of the other Decepticons as the war rages. When the Allspark is launched into space, Megatron follows but stops to answer a distress call from the Nemesis, which appears to have crashed landed on an ice world and been abandoned, except for The Fallen’s artifact. He orders Megatron to continue his search for the Allspark, which ultimately leads him to Earth. The events of the older prequel comics and the movie take place, as well as the Reign of Starscream miniseries before going right into Alliance. The Autobots clean-up the remaining Allspark-created mechs from the Mission City battle and then begin making preparations to dispose of the remains of the deceased Decepticons. Barricade is revealed to be alive and Starscream returns from his adventures on Cybertron to fight a resurrected Wreckage. In the course of the fight, he loses Frenzy’s head and destroys Bumblebee’s just-repaired vocal circuits. Starscream flees after the battle and Frenzy’s head is swiped by Simmons before Sector Seven is officially disbanded. Meanwhile, Soundwave arrives on Mars and heads for Earth. 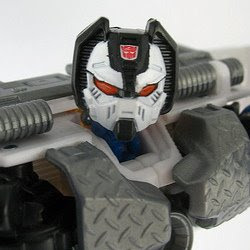 Several other retail-exclusive repaint Decepticons arrive and begin wreaking havoc. Jazz is buried at sea inside Optimus Prime’s trailer, and the defeated Decepticons are dumped in the ocean. A shard of the Allspark, which revived Wreckage, is given to the Autobots for safekeeping at their new base on Diego Garcia, where they have teamed up with Epps, Lennox, and the remains of Sector Seven to form NEST, an anti-Decepticon strike force. NEST then proceeds to defeat or capture all of the newcomer Decepticons and misses out on getting Barricade several times. Bumblebee is sent to look after Sam Witwicky, and new Autobots arrive from space, Sideswipe, Arcee, Chromia, a third motorcycle sister, and an ice cream truck. The story ends with NEST preparing to confront the Constructicon Demolisher in Shanghai. The events of the novel seem to take place within the middle of the Alliance series, although exactly where seems a little abstract. The novel opens with Megatron, dead, at the bottom of the sea, and this is where he stays throughout the book, no miraculous resurrections here. Cut to the Gulf of Aden where pirates attack a freighter which just so happens to be ferrying Epps, Lennox, Ironhide, Ratchet, and other NEST members to their base on Diego Garcia. Ironhide soon transforms to robot mode and scares the pirates off. Arriving at DG, the boys meet up with cybernetics expert Kaminari Ishihara, who has been swimming in the lagoon with the newly arrived Autobot veteran Longarm serving as lifeguard. Everyone enters a briefing where a sighting of Starscream in Zambia is discussed and a plan is hatched with Optimus Prime to confront him. Meanwhile, we find that Agent Simmons is now, with the disbanding of Sector Seven, working in his mother’s deli in New York. He’s also tinkering with Frenzy’s disembodied head in his basement. In Africa, we lean that Starscream is not only in the area, he’s gaining control over local rebel groups by using his internal synthesizers to create gold coins. He is also accompanied by three other Decepticons, Dropkick, Macerator, and Payload. They soon attack a local dam construction site, making short work of the security forces, and proceed to steal mass quantities of explosives. The NEST team soon arrives in Africa with Prime, Ironhide, and Ratchet as well as new arrivals Salvage and Beachbreak, who transforms into a commando jetski. The Autobots soon engage Dropkick, Macerator, and Payload in battle in the Zambezi River. This is all part of Starscream’s brilliant plan, however, as the Autobots soon discover that the current is pushing them towards Victoria Falls. Everyone but Prime and Macerator gets out in time, the dueling pair going over the side. Starscream swoops in to save Macerator while Prime dangles helplessly. Eventually the NEST team manages to haul Prime up using Beachbreak’s tow-cable, but the celebration is short lived as Starscream swoops in and knocks the diminutive Beachbreak off the falls and to his death. The Autobots and their human allies soon realize that Starscream may try and destroy a series of dams along the Zambezi and head off after the fleeing Decepticons. At one of the dams, the ground-based Decepticons attack. Payload heads to the valley floor to try and crack the dam with repeated blasts while Dropkick and Macerator fend off the arriving Autobots. After a short scuffle, Prime manages to knock Macerator over the side of the dam before dispatching his dangling foe with his built-in sword. Ratchet takes repeated hits from Payload while trying to melt the fissures in the cracking dam back together. Both Ratchet and the dam are ultimately saved when the humans enter the dam and open the flood gates, knocking Payload downriver and out of the book. A damaged Dropkick escapes and everyone returns to Deigo Garcia. Again, we cut back to Simmons in his basement, experimenting on Frenzy and brooding that that punk kid Sam Witwicky has a hot girlfriend and is going to Princeton. Frenzy tries to subvert the building’s electrical system, and after a little chaos, Simmons decides he needs to move the Decepticon head to a space beneath his mother’s deli. Back at NEST headquarters, two more Decepticon presences are detected and a pair of teams are readied to head out and take care of them. Epps and Russian scientist Petr Andronov accompany Longarm and impetuous young motorcycle Knockout to Peru to find Decepticons that have been detected in the deep jungles. On a steep mountain pass, the party is attacked by Decepticons Ruination and Blademaster. Despite inexperienced and risky behavior by Knockout, Both are severely damaged and driven off. Simultaneously, Lennox, Ishihara, Prime, Ironhide, and Salvage arrive in the Western Australian Outback and begin searching for Decepticons. Lennox soon realizes that the ‘Cons are attacking sites with energy reserves, oil and coal in Peru and uranium in Australia. The team decides that there is a second group of Decepticons not under Starscream’s command, harvesting massive amounts of energy in an attempt to revive Megatron. Arriving at a uranium mining site, the NEST team discovers a trio of construction vehicles which, naturally, turn out to be Decepticons. The leader, Kickback, takes Prime on and is quickly run through with the Autobot leader’s sword. The other two, Tread and Trample, are quickly killed through the combined efforts of the rest of the team. Back at DG, a small crab Decepticon infiltrates the base and hacks into the NEST computers before sneaking back into the sea and an unknown accomplice. Despite the break-in, the NEST team continues their usual business, discussing different ways the Decepticons could draw massive quantities of power to revive Megatron. In Italy, Starscream enters into a deal with an Italian criminal named Bruno Carrera to help destroy Optimus Prime in exchange for dominion over Europe when the Decepticons triumph. A plan is hatched and Swindle and Deadend begin ripping through the streets of Rome causing general chaos and trying to draw the Autobots out. After an extended chase where Knockout proves he has what it takes and more, Starscream challenges Prime to single combat inside the Coliseum. Prime and the Autobots enter the ancient structure, and Prime promptly falls through a trap door to a subway tunnel extension and into a strong set of restraints arranged by Carrera. Starscream then proceeds to attack the remaining Autobots while a helpless Prime is confronted by a vengeful Barricade. Before the Decepticon can dispatch Prime, the humans attack Barricade and Prime manages to work himself free. He easily hands Barricade his skidplate and returns to the surface where Starscream has fled. On his way to whatever scheme he has cooked up next, Starscream takes the time to visit Carrera at this villa, where he pays him back for his “failure”. Finally, Epps and Lennox are relaxing on the beach back at DG when Knockout approached and informs them that something significant is happening, mentioning how he is unfamiliar with the term “shanghaied”. Overall, the book isn’t bad. The Transformer fights are pretty well written and exciting, and the characterization of the robots is as complete as that of any of the humans. The story is fast-paced and there is very little filler. That being said, the story is more pointless than the last Movie prequel novel. The first 250 pages of the book seem to be about Starscream consolidating power while a second cabal of Decepticons works to undermine him and revive Megatron, but in the last 30 pages the story takes a hard left turn into the Rome battle and never returns. There’s no resolution to anything really. The asides with Simmons are especially meaningless and only serve to set up what I assume will be a story thread in the movie. 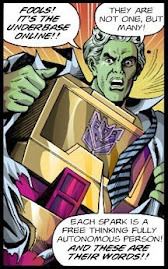 The last quarter of the book begins to feel like the old 80’s cartoon, with the Decepticons searching for energy sources and Starscream allying with the crime boss. It’s not bad per se, but it breaks with the tone that had been established for the Movieverse already. Events in the book mesh pretty well with what has been established in the two IDW prequel series. Some plot points and character appearances are a little cumbersome when you try to reconcile the novel with the comics, but nothing directly contradicts anything else. The battle in Mission City and, the presence of the Transformers themselves, are a target of a huge cover-up and misinformation campaign by the governments of the world. How many people are buying into it is uncertain. The acronym NEST is never explained in the book. I know I've seen what it stands for online somewhere, but it escapes me at the moment. At the base at Diego Garcia, Ironhide is stockpiling Energon, which is described as a Transformer energy source. Energon is manufactured from existing energy sources and does exist naturally in the universe in a more unstable form. There is evidence that it exists naturally on Earth, but the Autobots don’t have the time or resources to search for it. Energon doesn’t figure in to the story at any point, and the mention seems more like a nod to G1 and Beast Wars. 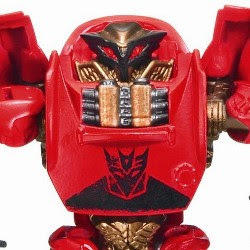 At one point when Epps and Ironhide are talking shop, it’s revealed that each Transformer has a specialty, and according to their specialty, they create ammo, supplies, etc through nannoengineering, quantum alteration of volatile compounds, and subatomic metaflux metallurgy. Essentially, eating scrap and creating stuff internally. Quite a few words are spent describing how extremely hot Kaminari Ishihara is. This, coupled with her being super-smart and a skilled martial artist, serves to turn her into nothing more than some sort of fantasy figure for dudes instead of a viable character. Optimus Prime - Prime is Prime. This Prime, however, is a little more direct and brutal than usual, impaling two Decepticons with his sword with no hesitation. Ironhide - Ironhide’s direct approach and habit of wanting to solve every problem by blasting or crushing it is still amusing. He does seem to have warmed up to humans a bit since the Movie. Ratchet - Ratchet again proves that he’s the most action-oriented, battle-tested Ratchet yet. Longarm - The obligatory grizzled veteran, Longarm does seem to genuinely enjoy being on Earth and interacting with the planet’s fascinating organics, even to the extent of playing with feral cats using his Tow-truck mode’s headlights. Don't make Longarm slap you! Salvage – A new arrival to Earth, Salvage has no real personality to speak of. Sharing the name and pickup truck mode of his toy version even if he wasn’t created by the Allspark like the toy bio says. 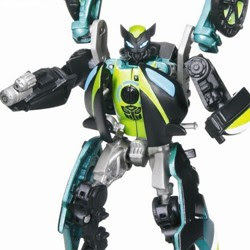 Knockout - Another new arrival, Knockout is the Movieverse’s version of Cheetor/Hot Shot/Animated Bumblebee. A young, impetuous motorcycle with a desire to prove himself, he endangers the team on the Chile mission and Longarm has to smack him across the face to straighten him out. A scene where Epps helps him alter his holographic rider from 50’s era Marlon Brando to something less conspicuous is pretty entertaining. Bumblebee is too seasoned and competent, so make way for Knockout! Beachbreak – The little commando jetski that could. His completely original name betrays him as cannon-fodder at the outset. Starscream - Starscream is the devious, power-hungry schemer we’ve come to expect. A lot closer to his G1 version here than in any previous movie material, a quick mention is made of his recent time on Cybertron in the Reign of Starscream comic miniseries. Frenzy - Not dead either, just an angry little head. Dropkick - Another pickup truck, Dropkick is pretty much you basic Decepticon. He exhibits none of the manic-depressive traits his toy bio points towards. Macerator - Macerator is a garbage truck with a massive shredding mechanism mounted to him. He’s a mean little brawler who likes to tangle with Prime, and get his skidplate kicked for it. Payload – Unlike the armored car toy version, this Payload is an anti-aircraft tank that spends most of his time using his weapons systems to the utmost. Ruination – A V-22 Ospery with a bad attitude. No mention is made of the established Osprey Decepticon Incinerator. Blademaster – An undetermined type of helicopter, Blademaster isn’t around long enough to matter. Kickback – Kickbak is the seeming leader of the small band of “constructicons” intent on reviving Megatron. He’s brash and confident, in no way hesitant when attacking Optimus prime. He uses his Bulldozer blade in robot mode as a shield, and his other hand is a huge warhammer which can emit a devastating sonic blast. Tread and Trample – A identical pair of excavators who are an example of Transformer twins. The sometimes speak in perfect unison and are very aware of each other’s actions and situation. Sort of like the Crimson Twins for GI Joe, but without finishing each other’s sentences. Swindle - A mean Decepticon street-racer, only slightly beyond his drone origins. Deadend - Not really all that different from Swindle. Deadend - Fast and Furious? Decepticon Crab Infiltrator – An unnamed tiny spybot. He doesn’t speak and seems to be a mech not unlike Scorponok or Frenzy. Overall, the book is a light and mostly entertaining read. The Transformer battles are the high points, and make up for the lack of any substantive narrative. It’s great beach, airplane, or lunch break reading. It’s probably by no means essential to a greater enjoyment of the Movieverse, but I do feel comfortable recommending it to any Transfan with a few hours to kill. But that’s just my take, if you’ve read it, let me know what you think! I am reading the book right now, and I think it is an excellent read (albeit one with obvious typos, like the one ON THE BACK COVER IN BIG, BOLD LETTERING, and a few oddly repeated sentences in a few chapters). I especially find humor in the supposed Russian scientist., Petr. i am Russian myself, and he acts and talks nothing like a real Russian would, but it is amusing to see how Americans perceive us. Overall a very good book. I'm not finished it though, but I've got about 2 hours left. of it. I Enjoy in thoroughly. It is a good book to read after the first movie and before the second. I just finished reading The Veiled Threat and must agree that it's pointless for the most part. My enjoyment of the novel was hindered by the fact that the story didn't seem to have any direction. Reading the novel, I at first appreciated Foster's attention to detail. He paints wonderful landscapes with words and represents the natural beauty of Earth effectively. However, after reading for the 4th or 5th time how a new location is just as barren of human activity as the last while cataloguing the various flora and fauna, I couldn't help shake the feeling that Foster was less interested in his characters than the weeds growing in the sidewalk. Petr Andronov comes across as personification of the author's love of nature, constantly occupying his attention with bugs, shells, and vegetation while rockets rain overhead. The battles are the highlight of the novel second only to chapter 13. The 13th chapter features a Decepticon crab infiltrator, and no, it's not because of the crab alt-mode that I liked this chapter so much. For perhaps the only time in the entire novel the feel of the first movie was captured where Decepticons like Frenzy actively hid in plain sight and maneuvered their way past unknowing humans. It's the sneaking element, the Metal Gear Solid fanboy in me that really loved this chapter. No clue as to who the crab-spy's accomplice is though. An unfortunate side-effect of being a prequel novel is that several story-threads are merely setting up the movie. As a result, Simmons' sub-plot with Frenzy's head (which never factored into ROTF) goes nowhere. The crab infiltrator, while fun, added nothing to the story. It was after NEST's information database with no clear reason. What kind of info was it looking for? Who sent it, Starscream or the Decepticons attempting to ressurect Megatron? We'll never know, I guess. The Decepticon threat is extremely reduced in this novel, portraying the Autobots as the victors of every battle. Optimus is certainly worried about the Decepticon's overall plan but he shouldn't be. They thwart every Decepticon strategy put forth (except the spy crab) and reduce the 'con numbers significantly by book's end. To sum up: it's light reading that offers a few worthwhile tidbits. Worth a read, but I doubt many people will feel compelled to read it a 2nd time.